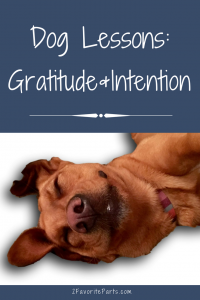 What do you get when you combine a stack of Law of Attraction books plus a sweetheart of a dog? Slobbery metaphors, of course! Anyone who’s ever owned a dog understands this: they teach us more than most humans do, their love is unmatched, and if we all behaved a little more like our furbabies, the world would undoubtedly be a better place. So allow me to introduce Lillie, a 1.5-year-old lab mix of caramel fur, perpetual smile, wide and innocent brown eyes, and two ears that often stick out a la The Flying Nun. If there are angels, certainly a bunch of them are covered in fur, wouldn’t you agree? The universe couldn’t have sent me a better match (or did I ask for it? 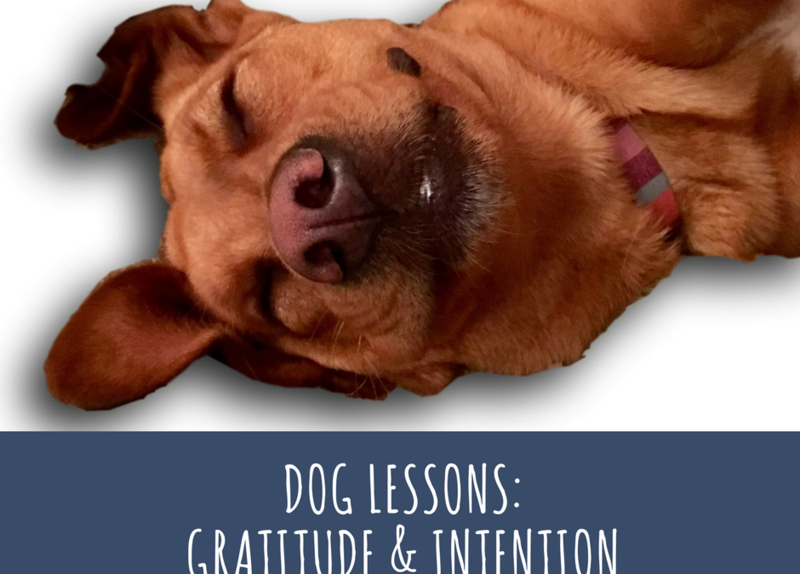 I did envision the dog personality – doganality? – that I wanted for years before Lillie’s arrival, after all). 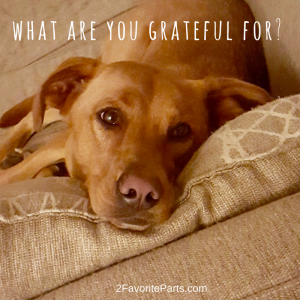 Who or what is more grateful than a dog? Don’t even try – there is nothing. Gratitude is fundamental to happiness and to lasting success. It’s a core principal in the Law of Attraction. And I’m working on it. Lillie sleeps on my bed. (Get over it.) So every morning, I wake up to a set of big brown eyes looking adoringly at me, a wagging tail and kisses. Maybe you’re lucky enough to have a partner who looks at you like that in the morning. But I’ll wager they don’t look at you that way every. single. day. Lillie is grateful for her breakfast. To be let out. To be walked. To go for a run. For a belly rub. For a scratch behind the ears. And you know what? You haven’t seen a happier creature. Happiness follows gratitude. Is it possible for someone to be sincerely happy who does not have gratitude in their life? I can’t imagine it. So where can we learn to exercise more gratitude? Even in our less-than-perfect world? I spent too many years looking ahead instead of enjoying the moment. Too much time planning for when things were better: my house, my car, my finances. And while goal-setting and making plans are important, there was a key component I missed: as I envisioned these things and wished fervently for them, they were always in the future. If it’s true that the universe – or your subconscious, however you choose to look at it – returns to you what you feed it, then my message was always about good things happening in the future. Never in the now. So here’s a lesson: show gratitude the way Lillie does. Wag our tails at everything. Today. Right now. And see what wags back. Instead of: God, I can’t wait to get out of this sh*tty rental with its peeling paint, mold and mildew, one tiny bathroom with a yellow toilet and highway noise. Try: I am so grateful to live in a four-bedroom house on a safe, dead-end road with a yard, a deck, a fire pit, and quiet neighbors. Instead of: I can’t believe I just got divorced. I’ve failed my son, wasted the best years of my life in the wrong situation, and made the most colossal mistake ever. 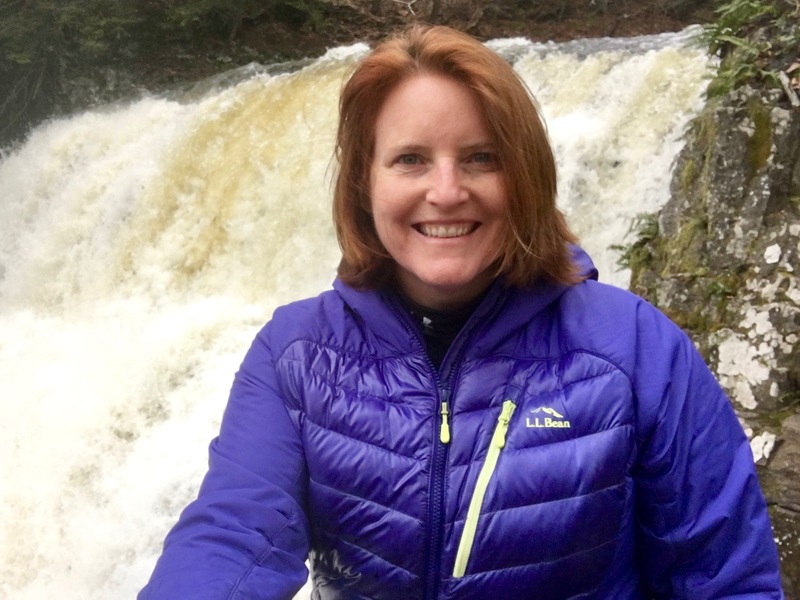 Try: My life lessons make me stronger and will be used to help others in their struggles. What I’ve learned will be used to benefit many, including my son. I’m developing a new normal, and it can be whatever I want it to be. This is a second chance. Disclaimer: There are times we’ll go through monumental loss or even trauma, and I’m not going to tritely suggest that gratitude alone can carry us through. Maybe in those times, however, searching for a seed of gratitude whenever we can muster up the energy can help in some small way or serve as a life preserver we throw ourselves. But this post isn’t about those situations. This is about the rest of the time. In our everyday lives, on most days, even on the most frustrating, maddening, disheartening of days, we can find *something. * And by stringing together enough expressions of gratitude, we build a habit. We create intention. Scary kitty gives Lillie the stank eye day in and day out. Scary kitty pops out from behind the couch sometimes, just to be an ambushing little jerk. Scary kitty does not show gratitude for the affable, wimpy dog in his life. And Lillie has a hard time looking scary kitty in the eye. Which, hilarious as it is, is not always a bad thing. This got me thinking. Maybe, instead of zig-zagging like a freshly-deflated balloon flying helter-skelter around the room, I should be more still when “danger” arrives. Stand still and focus. Wait it out. Keep my head. We’re supposed to focus on what we do want rather than what we don’t want. And Lillie typically does this. 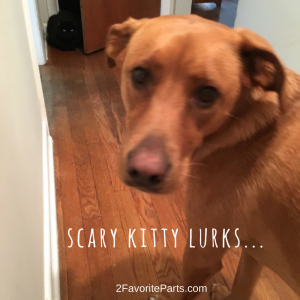 When scary kitty comes around, Lillie focuses on being still and waiting it out. Looking at anything except that fluffball of peril. She is not looking at what she doesn’t want. This isn’t to say that Lillie ignores danger, same as we shouldn’t blow it off. It’s in her peripheral vision. But she’s not staring it in the eye. What you focus on, grows. So when we focus on and obsess over danger or limitations or obstacles, we actually attract them. Ain’t that a pisser? Every once in awhile, Lillie barks and bounds after scary kitty, chasing him into the safety of the basement. So there’s a balance between holding still in the face of danger, and telling it you’re not gonna put up with its bullsh*t anymore. Actually, the more often Lillie bounds after scary kitty, the more emboldened she becomes. Face that fear, girlfriend! So what do you think? Do Lillie’s approaches to gratitude and danger make sense for you? What other thoughts can you add? About Me page got you tongue-tied? 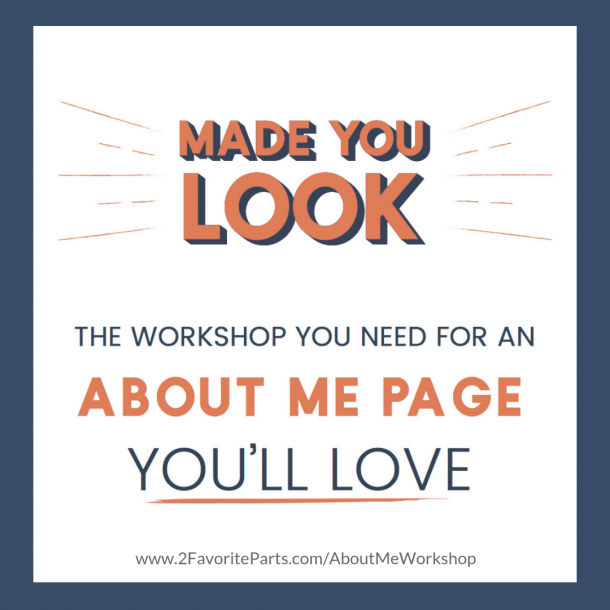 Get your FREE About Me Page outline! An excerpt from the "Made You Look" workshop, this easy-to-understand graphic will show you what information you need to include on your About page and the order in which you should lay it out. Check your inbox for your free outline!! I'm Karin, creator of 2 Favorite Parts. I use my words and help others use their words ... which means I help business owners tell their stories to be more effective. Story is everything -- the stories we tell ourselves and the stories we tell others. They matter, whether it’s because of the importance of having the right mindset or because of the importance of building relatability in your business. Or rather, the combination of both. The name 2 Favorite Parts emerged from an exercise in gratitude that's become a type of mantra for me, and I hope you come along! Get your FREE About Me Page outline! This easy-to-understand graphic will show you what information you need to include on your About page and the order in which you should lay it out. Check your inbox for your freebie!